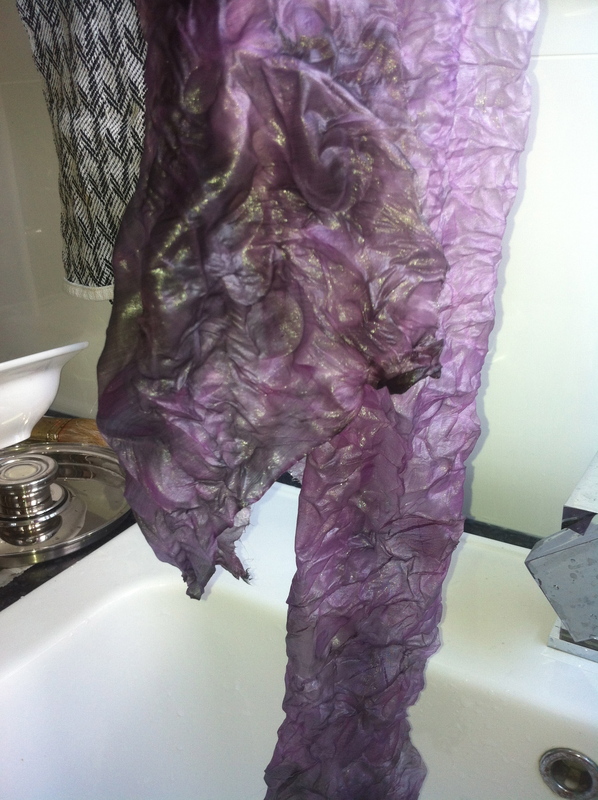 I’m in a dyeing mood, so I’ll just get those four ancient purple carrots out of the crisper. And that pile of brown onion skins from the slow cooked lamb shanks of last night. 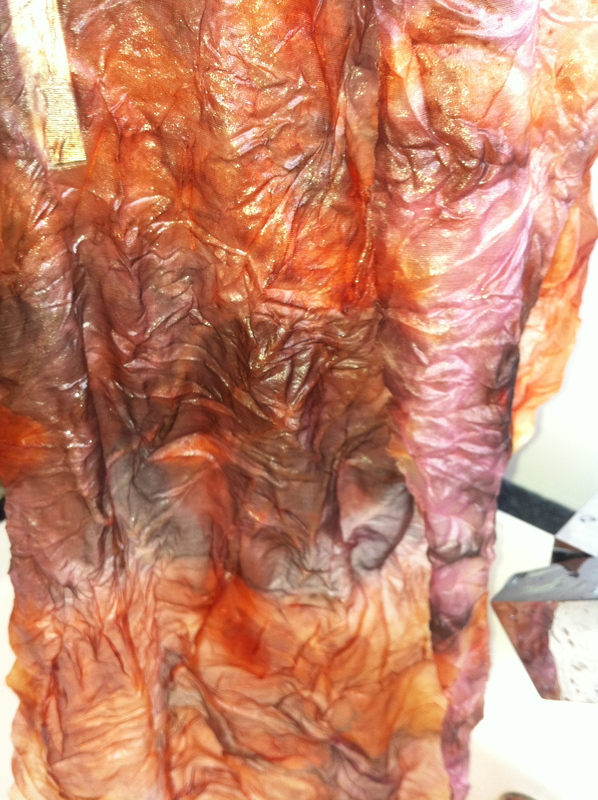 Oh, and the slab of frozen pomegranate skins that Liz gave me last year. While I’m at it, it’s time I used those frozen avocado skins too. I was lucky enough to secure four metres of handwoven Cambodian silk organza from Trudi Pollard two nights ago. Trudi was the guest speaker at the WAFTA meeting but still managed to find time to bring me some silk. 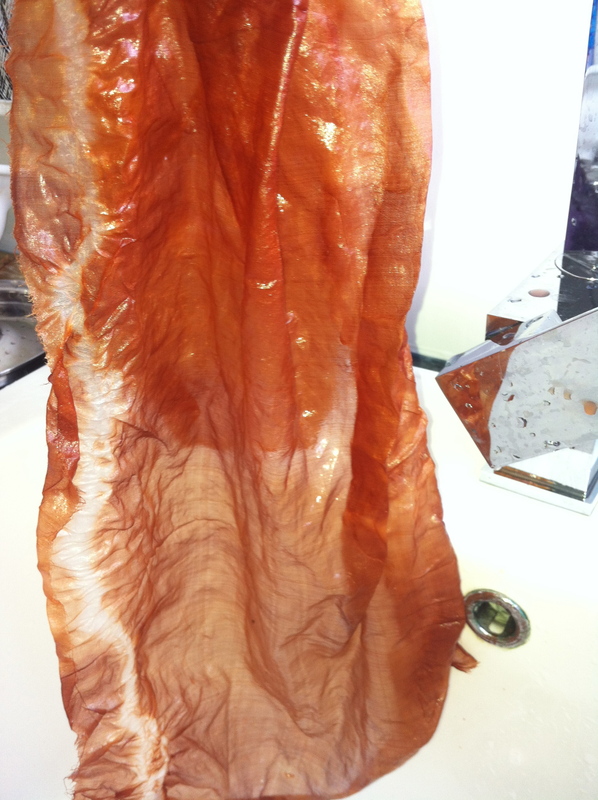 I didn’t do anything to the silk other than rip it into four strips each about 25cm wide and dampen them. In my first stainless steel pot I put about a cup full of sliced purple carrots into water and brought them to the boil. Taking one strip of dampened silk organza I placed more purple carrot slices on half, folded the rest of the silk over and then rolled the “sandwich” tightly into a tube, securing it with twine. This was dropped into the purple carrot solution. I called this Bundle 1. In the same pot I put another tightly bound tube of silk but this time the material inside the tube was brown onion skin rather than carrot. This was Bundle 2. Both bundles were boiled for about fifteen minutes then the heat was turned off and the pot allowed to cool overnight. In a second stainless steel pot I boiled up a couple of cups of chopped avocado skins in water for about fifteen minutes. 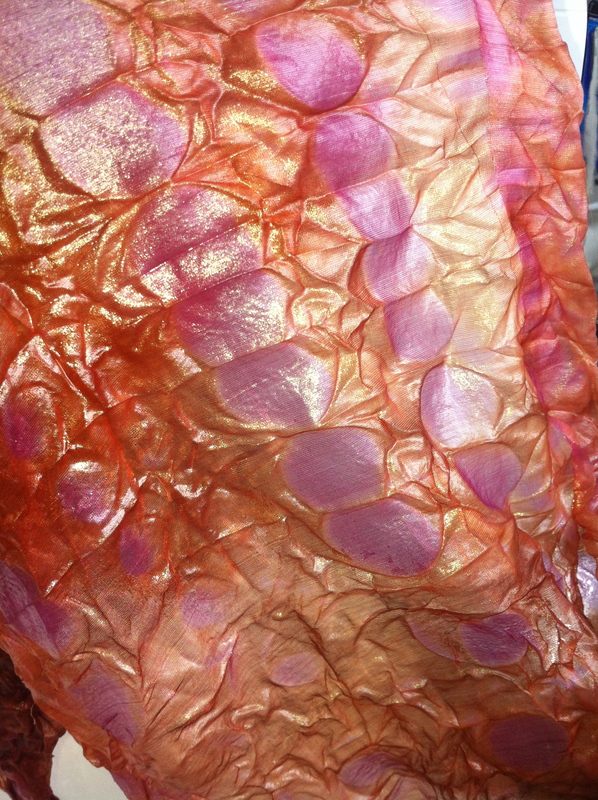 Into this I placed Bundle 3, a strip of silk organza wrapped fairly loosely around a solid frozen tube of pomegranate skins, secured at each end with an elastic band. Bundle 4 also went into this second pot. 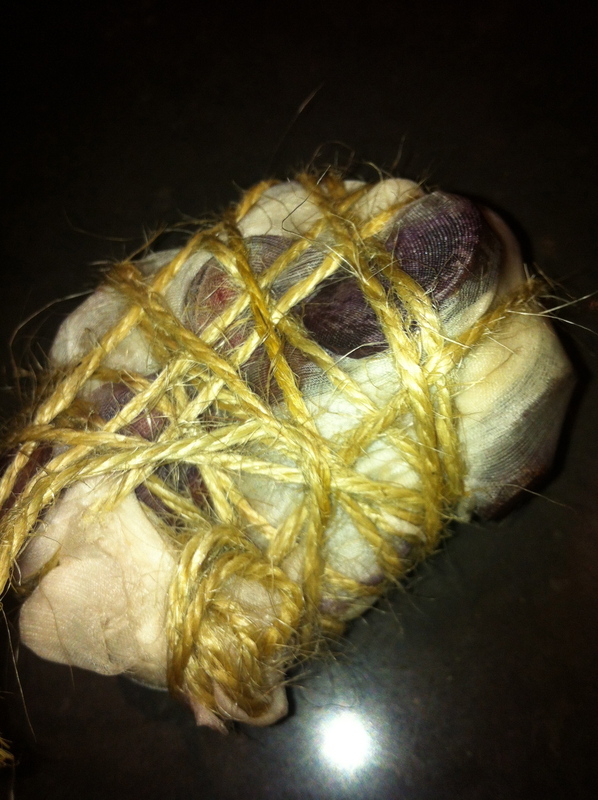 It was a strip of silk organza wrapped tightly with twine around slices of purple carrot. I thought it would be interesting to compare a piece of silk with purple carrot inside boiled in purple carrot solution (Bundle 1) with a similar piece of silk boiled in avocado solution Bundle 4). Again both bundles 3 and 4 were boiled in the avocado solution for about fifteen minutes then left to cool overnight. Bundle 4: tightly wrapped carrot boiled in avocado skins. Bundle 3 was insipid due to not having been tightly bound. So I rewrapped it with tighter bindings and reboiled it in carrot water. another story. OK result but not heroic. The results of Bundles 1, 2, and 4 are, however, quite pleasing and I can see a bojagi piece forming . Left: Bundle 1 (Carrot in carrot). Top: Bundle 2 (Brown onion in carrot). Bottom: Bundle 4 (Carrot in avocado). Great creations Margaret! Very exciting. Look forward to seeing what you make with them. Gorgeous intense colours. I’m loving the spotty effect of the carrot in avocado… great fun! This post was from 2014. 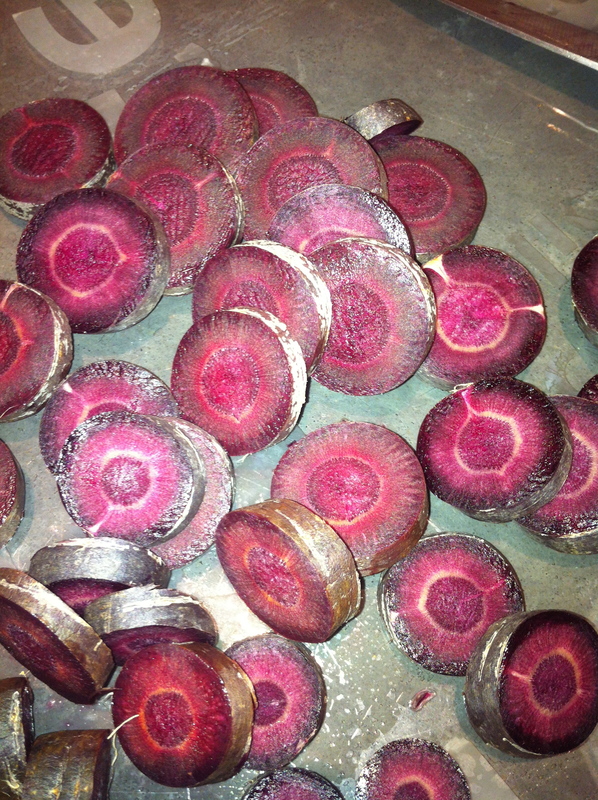 I’m curious – is the dye from the purple carrots fugitive or substantive? How have the colors from the avocado and purple carrots held up? 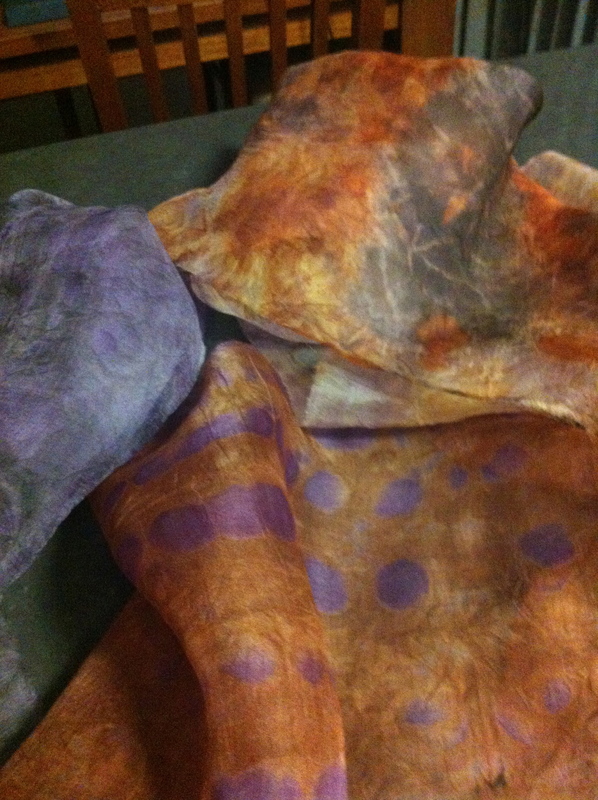 nI’d like to make some silk scarves with them, but am wondering how long the color will last. I have found both pretty durable BUT I don’t use them in clothing which will be in the hot sunshine here. I use them in wall hangings. Certainly not fugitive in the sense that they change within days or after heat is applied or after they are washed. I have prints from several years ago.